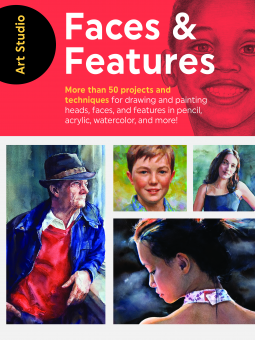 Art Studio: Faces and Features is a wonderful introductory guide for artists. I love the way the book covers not only general thoughts on facial anatomy and shading but also the different techniques needed to work on portraits in various media. It provides an excellent overview so you can try out diverse techniques and styles to see what suits you best. As a graphite artist, I found the section on pencil drawing most interesting, and I especially loved the pages on how to draw hair, as that is something with which I still struggle in my portraits. I would recommend this book for amateur artists who are still deciding which medium they wish to pursue and wish to see their options, and for portrait artists in any media who are looking to improve their technique.